I don't often say I like the bookstore more than the library (you do have to buy the books there, after all), but it is better in at least one area, and that is that it's much easier to see at a glance what the most current books are and the new books that have been published this year. 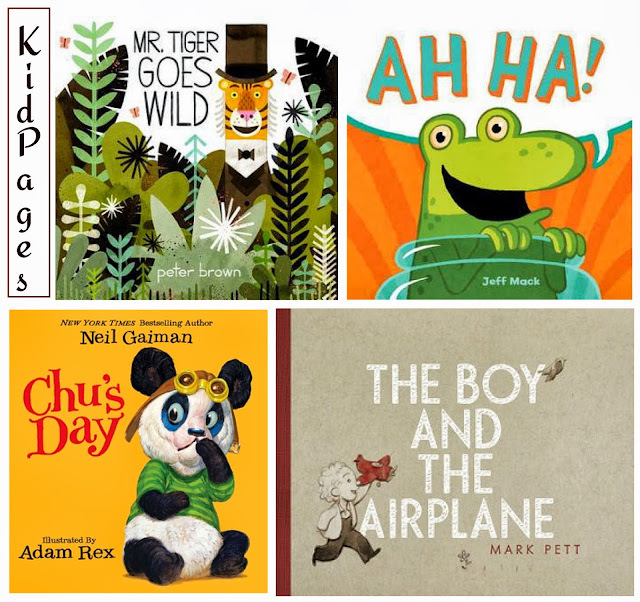 As much as I love discovering old books, it is equally fun to read brand-new ones and to know that fantastic picture books are continuing to be published and that there are so many talented authors and illustrators who are creating new stories every day. These four books were all published this year, and I would happily go back to the bookstore and buy all four of them. They are keepers for sure. I think my first thought while reading this book was, "How did someone (specifically, Peter Brown) come up with this idea?!" It takes a theme that's common in picture books (be yourself) and treats it in a completely unique way. Mr. Tiger lives a proper existence. He wears a top hat, a tuxedo, and a bow tie. He uses good manners and never misses tea time. But he is so bored! One day he tries something new. Something wild. He gets down on all four paws. Mr. Tiger feels invigorated and alive. But everyone else is scandalized. However, Mr. Tiger has made the first break in social conventions, and before long, everyone else is able to be a little more relaxed (and a little more themselves) too. One of the best things about this book is the great balance between the text and the illustrations. Some pages include just a few words while other pages include no words at all. This makes it so that both the words and the pictures are able to shine and pack a punch as needed. And oh, the illustrations. 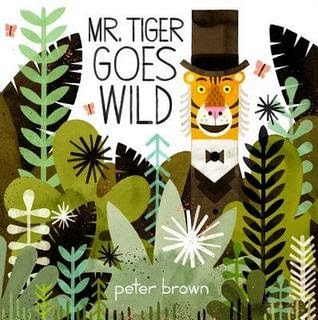 I really, really love Peter Brown's style: the texture, the colors, the square corners and silhouettes and straight lines. Plus, a tiger in a top hat? Totally awesome. I would love to see this get some Caldecott recognition come January. This little gem uses just two letters (and some really great pictures) to tell its story. It is about a frog who spends an eventful day being chased, being caught, and outsmarting his captors. All of the characters express their thoughts and emotions using some combination of "A" and "H."
There's "Aahh!" (relaxing and enjoying the sunshine), "Aahh," (said with a hint of relief), "Aahh!" (screaming in fright), "Ah ha!" (I have a great idea! ), "Ah ha!" (like, "I've caught you now! "), and "Ha ha!" (said in a taunting way). It is a great one to read aloud because you get to vary your tone and inflections in all sorts of ways to convey the underlying meaning of each word. 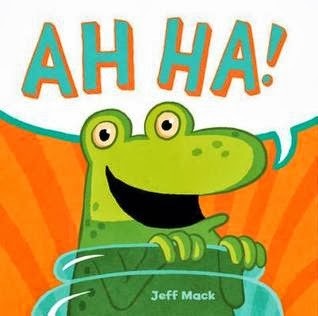 And my kids think it is so funny (especially when the frog is sticking out his tongue at the turtle, crocodile, and flamingo and saying, "Ha Ha!" as he makes his escape). Speaking of the turtle, crocodile, and flamingo (oh, and did I mention that there's also a little boy and a dog? ), yes, it is an unlikely combination of animals, but it really works so well in this plot (a turtle disguises himself perfectly as a rock, a crocodile as a floating log, and a flamingo as some tall pond reeds). The illustrations are bright and vivid. The story could easily be told without any text at all, and because of that, the text is used to add just an extra touch of humor. It is a simple story that is creatively executed. 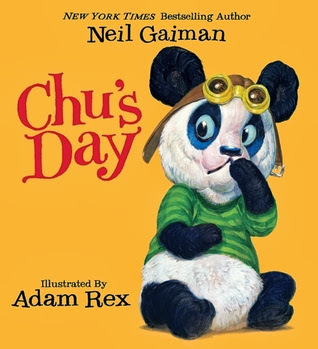 Would it surprise you to learn that, before this book, I had not read anything by Neil Gaiman? I know he is a very strong presence in the literary world right now . . . but . . . his books sort of terrify me. They all just sound so dark and creepy. I'm just not sure they're for me. But this book? Not dark or creepy in the slightest. (Unless, of course, you consider an enormous sneeze dark and creepy.) In fact, this book is so cute and so silly, you'd never guess it was created by the same person who came up with The Graveyard Book. Chu is a little panda with epic sneezes. All day long his parents are on guard. At the library, his mother anxiously asks, "Are you going to sneeze?" At the diner, his father also takes the necessary precautions. But when they're at the circus, neither one pays any attention to Chu. And of course, that's when the sneeze finally decides to strike. This book is so much fun to read out loud. Seriously, I don't think there's any other way to read it. Each time Chu says, "Aah-, Aaaaah-, Aaaaah-, . . . No," my kids erupt in a fit of giggles. Even though the "no" doesn't take them by surprise anymore (oh, I wish I could relive that first reading of this book), it is still uproariously funny. And it's because when you read it aloud, you can do all sorts of things to draw out the "aahs" and make the "no" super small and meek. I should also mention that this would be the perfect past-bedtime read. (You know those evenings where all you want is for your kids to be in bed right this second, but they act as if going to bed without a story equals the crime of the century?) You can read this one in two minutes, and it will put both you and your children in happier, more amiable moods. Ah Ha was bordering on wordless, but this one is wordless in every sense of the . . . not word. Wordless picture books can be a little hit or miss for me. Sometimes I love them (Chalk, Tuesday, etc. ), but when there is too much happening on the page, they feel tedious to "read" out loud. I feel like I have to offer some sort of commentary for what's going on, but it ends up feeling too wordy (which is a weird thing to say about something that has no words at all). But I happen to love The Boy and the Airplane. The story is a quiet one. 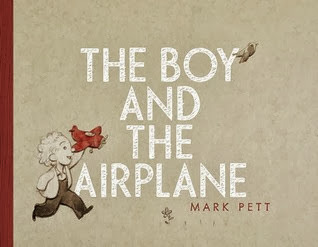 It's about a little boy who is gifted a toy airplane. He runs around the yard with it and finally decides to test its flying ability. He pulls back and launches it into the air where it, most unfortunately, lands on the roof. The little boy tries everything to get it down but without any success. As a last resort, he plants a tree. After many years (when the little boy has turned into quite an old man), the tree is finally tall enough to climb, and he rescues his beloved airplane. The story is quiet for several reasons. First, it features a solitary character. We catch the tail end of an interaction at both the beginning and the end of the story, but that is it. Second, the illustrations are very subdued: pencil with soft, muted background colors of green, blue, and brown. The only more vibrant color is the red of the toy airplane. Also, for most of the story, the boy's face displays only subtle hints at emotions. And finally, this is one wordless picture book that doesn't demand any words at all, but if you're reading it aloud and feel so inclined, a soft narration here and there is plenty sufficient. Even though the facial expressions are minimal, this is still a really emotional story. The ending is especially touching to me. The old man (who used to be the young boy) is still a child at heart, and the joy at having his airplane back is evident on his face (a rarity, as I already mentioned). But then he does something that is so sweet and kind and really brings the story full-circle. I won't spoil it here, but trust me when I say that this is a treasure of a book you don't want to miss. I hope I've piqued your interest enough for you to check out these new books. But in case you need one more push, how about if I tell you that all three of my boys like these books equally well? That's a rare occurrence in this house, and one that I totally welcome with open arms. These all look really cute! I love the bookstore for this reason, too — though I rarely buy anything. Amazon is just so much cheaper! Hey, thanks for these. I was just thinking about what books I should get for my Little Man's birthday, I will be looking into these ones.